There are a great many selections of Thyme grown in gardens, all of them with some degree of spicy fragrance. 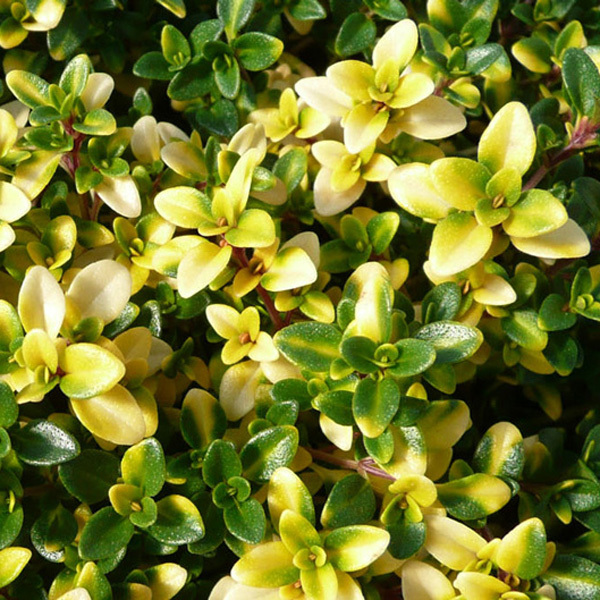 This low, creeping variety, has dark green foliage, tipped with bright gold in fall and winter. Pleasant lemony fragrance. Nice display of bright purple-pink flowers in mid summer. Can be used in between flagstones and will tolerate moderate foot traffic. Creeping Thyme is easily divided in spring or early fall, and even small pieces will take root and grow. Drought tolerant, once established. Attractive to butterflies. Evergreen in warmer climates.